Sorry for posting so late this week. I am not really sure what to say this week since there really isn’t that much new going on right now. Graham will be 9 months tomorrow which really blows my mind and also makes me a little sad. Although, I love this age and have so much fun with him each day. While I miss the newborn phase in some ways in most I don’t miss it one bit! My formerly sleep deprived, screaming baby is now a very happy, well rested 9 month old. The crying is much less now and is usually more of a whine which is almost always translated as “give me more cheerios….now”, “feed me faster”, “i’m getting tired, but not am not willing to admit that just yet..”, “i really really don’t want to practice rolling, crawling or anymore tummy time”. He is such a happy little baby. Loves to just sit and take things in, play with his toys. He is so proud of his accomplishments and always looks at us with a huge grin anytime he thinks he did something totally awesome. We always cheer, clap and tell him just how awesome he is which he loves. He loves to stand and play now and tries so hard to pull up. He can pull up depending on what he has to help him, but most times we have to give him a little nudge to get all the way up. He has the balance down, but not always enough strength in his legs to get up. A couple days ago he started walking while we hold his hands. This is his new thing and he is all about it. He could care less about crawling. Walking is where it is at and he is more than happy to practice. He is a long way from doing it himself, but at least he is trying. I won’t be surprised if he completely skips crawling. He now loves to kick his legs. 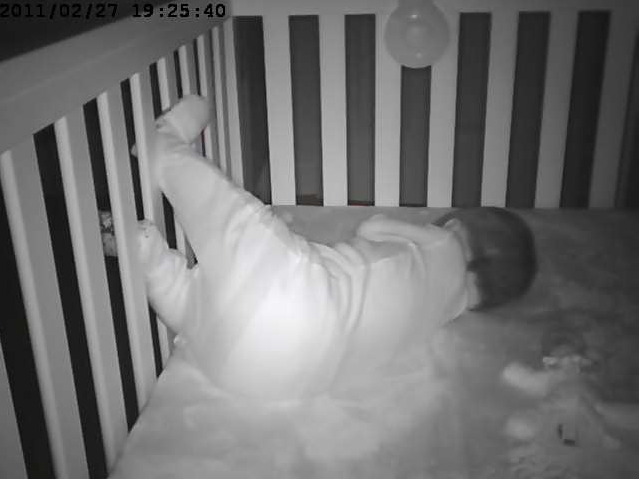 Okay, he has always loved this activity, but is really into it lately especially in the crib. When he goes down for a nap and when he wakes up he kicks both legs over and over. He shakes this crib which shakes the mobile so he thinks that is pretty cool. Yeah, you aren’t supposed to have mobiles at this age, but since he doesn’t pull up in the crib yet I don’t see why he can’t still have it to look at and “play” with in the crib. For a baby that used to scream the second you put him in the crib he sure loves it now. In fact most mornings he doesn’t even cry to get up. He hangs out in there playing and kicking until we come and get him. Granted I hear him in there playing so we get him before he has a meltdown. It is fun to watch him kick those legs. He gets his whole bum off the ground and then slams the feet down. Seems like it would hurt his heels, but he doesn’t seem to mind. He is also more into books than he used to be, but still doesn’t seem to care that I am reading to him. He reaches for the pages now and loves to touch them. We have lots of touch and feel books so I read those most of the time. He really likes touching all the different textures and loves when I make animal noises for him. I am not sure why this is so amusing, but baa is his favorite. He almost always laughs when I do that one. This week he has also started trying to roll again. He has rolled many times in the past 5 months, but he doesn’t do it often so he seems to forget. He never figured out that it is a way to get around and doesn’t seem to get it yet. However he has started trying to roll more in his sleep and sometimes when I have him up during the day. The other night he apparently rolled to his stomach and was stuck there all night. Poor little guy never cried, but I heard him wake up every 2 hours or so all night and couldn’t figure out what was going on. 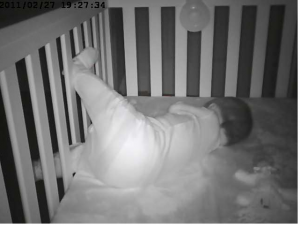 Since he just kinda babbled to himself and never cried I didn’t go check on him. Finally at 6:30 in the morning I figured I would just go get him and sure enough he was on his stomach trying to roll with his arms out to his side. He used to roll from tummy to back all the time, but seems to have forgotten lately and now insists on rolling with his arms in a T which is clearly never going to work. I felt pretty bad that he had been stuck for so long, but I guess it wasn’t too bad since he never cried about it. Last night he rolled to his belly around 10pm and was fussing about it so I went in and flipped him. When he saw me he got pretty upset, but as soon as I shut the door he rolled over and went back to sleep. The rest of the night he stayed on his back and sides. Here is a cute picture from him sleeping the other night. We watched to see how exactly he was going to get his legs out, but it didn’t bother him one bit. Never woke up and just pulled them out and rolled over to his other side. 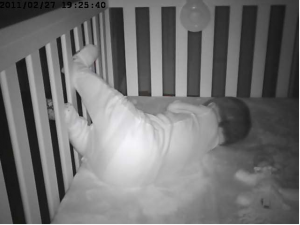 I love checking in on him when he sleeps because he is all over the place in that crib! One night I checked the camera about 30 minutes after I put him down and there was no baby! 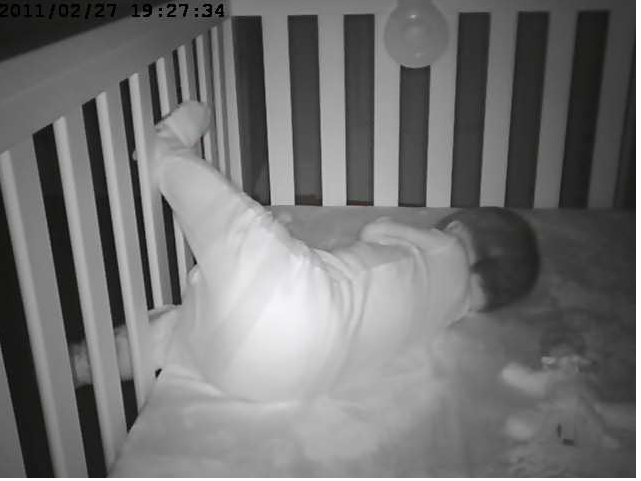 I made Casey go in and check to make sure no one took him, but he had managed to get to the bottom of the crib and was all curled up down there. Finally here is a little video from the other day.